Ok, who decided to hit the fast forward button this week? I blinked Monday morning and now it’s Friday afternoon without a single post! Anywho, I’m here now and wanted to share another No-Spend January project. Several months ago the TV in our family room started having speaker issues, so I agreed that it was time to replace it. The hubs researched options and found the exact one he wanted at Best Buy just in time for one of the fall holiday sales. Unfortunately, when he arrived at the store they didn’t have any in stock, despite the website showing several available at that location. So the sales associate made him a deal, a bigger TV for the same price! And do you know what my hubby said to that? 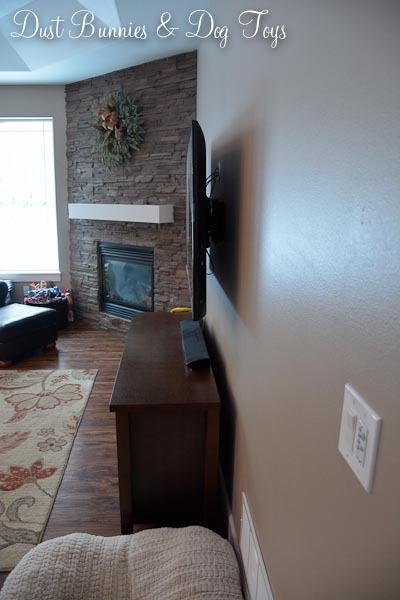 “Well I didn’t really want a TV that big….” Say what?! He’s got to be the first man in history to ever have that thought cross his mind let alone his lips. And that’s why I love him. Still, it was an offer too good to refuse and he came home with a monster 50” TV. The old TV, which we sold to recoup some of the cost of the new one, left room on either side for my decorating but this new behemoth filled the entire top of the TV stand. I don’t have a picture of the old TV in the space, but you can see how large the new one looked in the background of this shot. Although he was hesitant to put a hole in the wall, I insisted the wires needed to disappear and not just be camouflaged. A few days later he consented and cut two holes – one behind the TV and another behind the TV stand – so he could fish the necessary wires through the wall. Here’s the end result! Soooo much better! 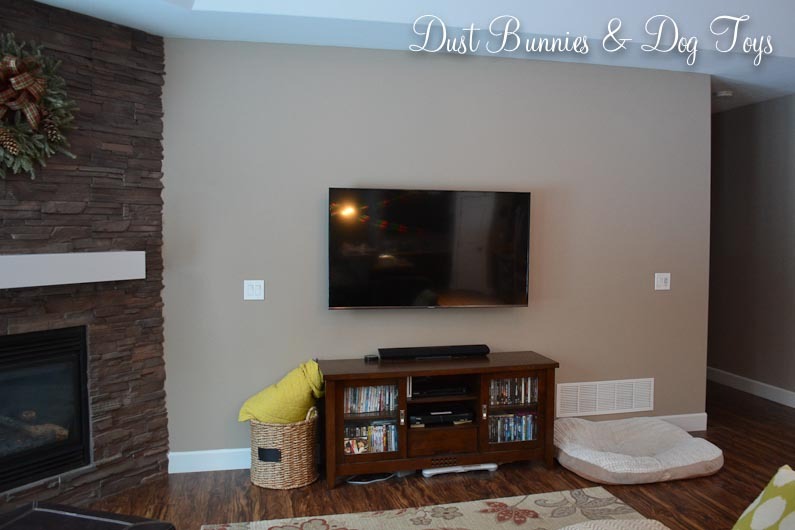 Just look at all that open space on the TV stand just begging to be decorated for Valentines! Oh, and that extra speaker thing now has breathing room (cough, cough). Another improvement is the side view, which is seen from our entry way. No more mess of wires behind the stand. Well howdy strangers! I bet you’ve been wondering where I’ve been the last two weeks. 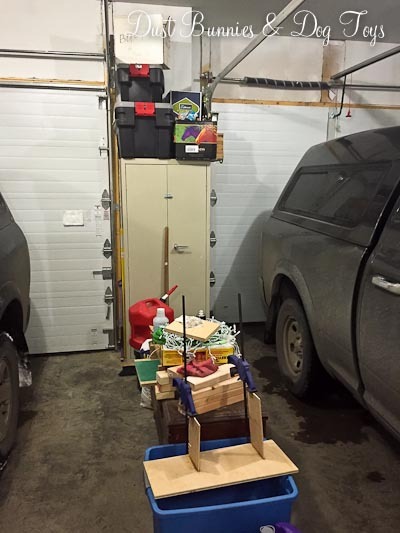 I’ve been on a mission – the Great De-Crapification of 2015! It began at work with the announcement that my department would be moving to a new suite. 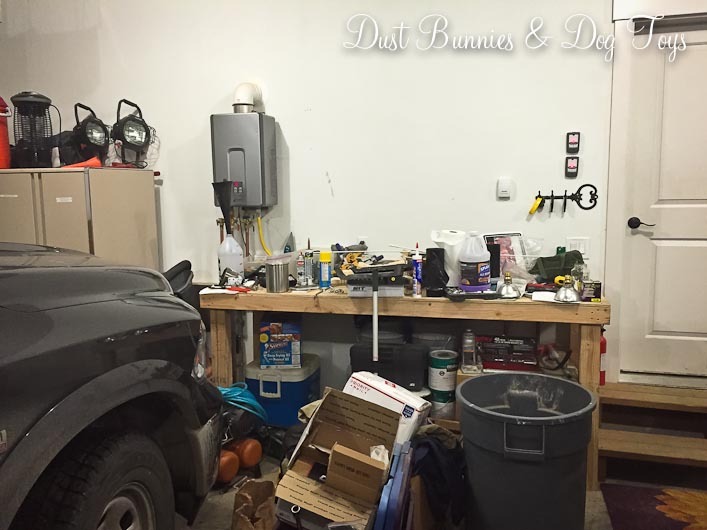 Because our new space didn’t have as much storage for all of our materials we had to downsize, which led to me purging years of accumulated stuff that pre-dated my time at the company ranging from tools and promotional items to costumes and party décor. Once I’d sorted everything and packed what the movers needed to take I was left with a mountain of ‘un-needed stuff’ which was offered to the employees of other departments and promptly disappeared in what can only be described as a cloud of human locusts. Although I admit that a few items came home with me rather than go in the freebie bin (it is still no-spend January after all and I’m an employee too! ), I was still in decrapification mode, so the purging continued at home. 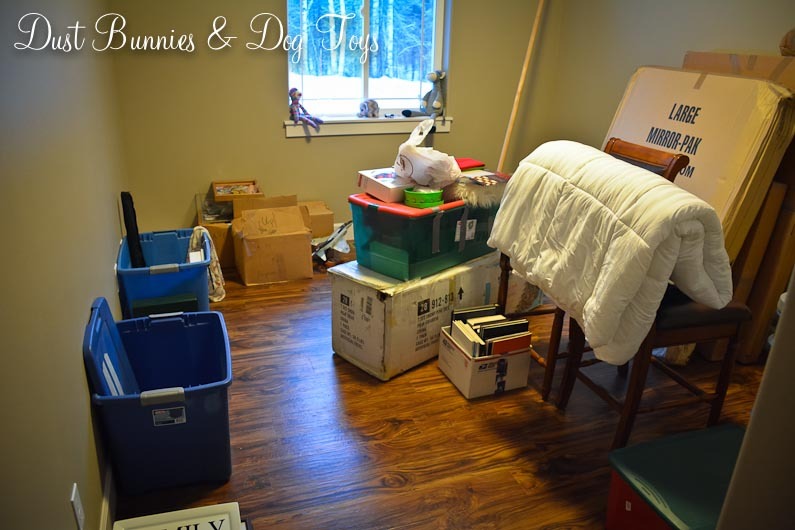 The spare room – AKA “I don’t know what to do with that yet, so put it in there and close the door so I don’t have to look at it in a pile” room – became my next target. Here’s how the room looked before the great decrapification. Seriously, that’s a lot of stuff! And here’s how it looked after. I think I hear angels singing! Granted, a good portion of the stuff went elsewhere for storage (i.e. the crawlspace and the shed), but at least it found an appropriate home. There are still several items in the space including a box of military stuff belonging to the hubs that I refuse to go through because I’m sure to throw out something important from his career, things that won’t have a home until other projects are completed around the house and the two extra chairs for our dining room table. Amazingly all that fits in the closet or along the far wall, making the main area of the room a perfect open spot for an elliptical the hubs scored on a local buy/sell page for $50 to help him lose weight. At least it’s not in the living room and since I have a list of projects to do before I work on this room it’s the logical place for it. For now. To this in just a few short days! It still has quite a ways to go, but being able pull in without calculating how far I can open my door is so much less stressful. Shortly after we moved into the new house I found a wood tray from a cannery at an antique store. With three compartments, I knew it would be a great way to organize my laundry supplies. 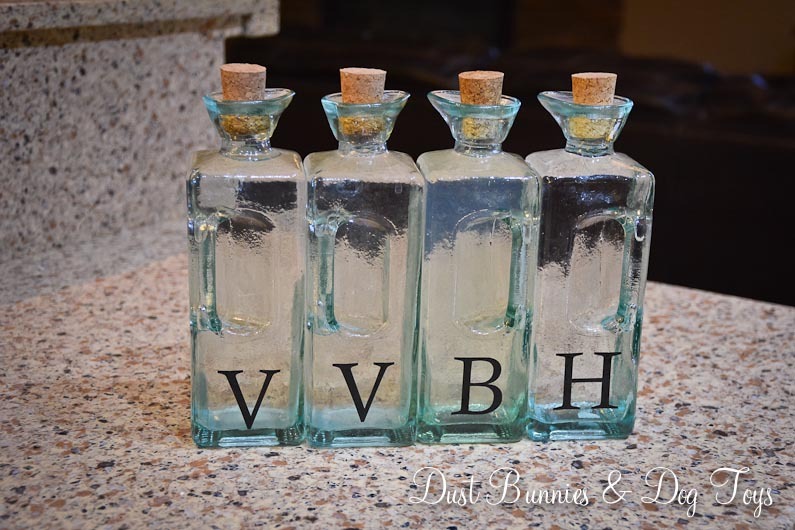 Later when I saw these cool bottles on clearance at Pier One I knew they would be perfect for storing things like bleach. 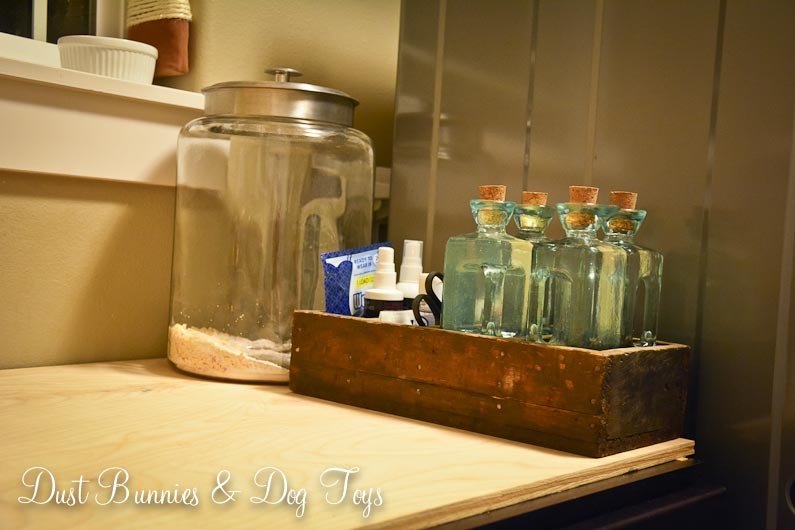 I also keep vinegar and hydrogen peroxide in my laundry arsenal so I got a couple extra bottles to hold those items as well. Luckily, the bottles fit perfectly in the compartments of the tray when paired. 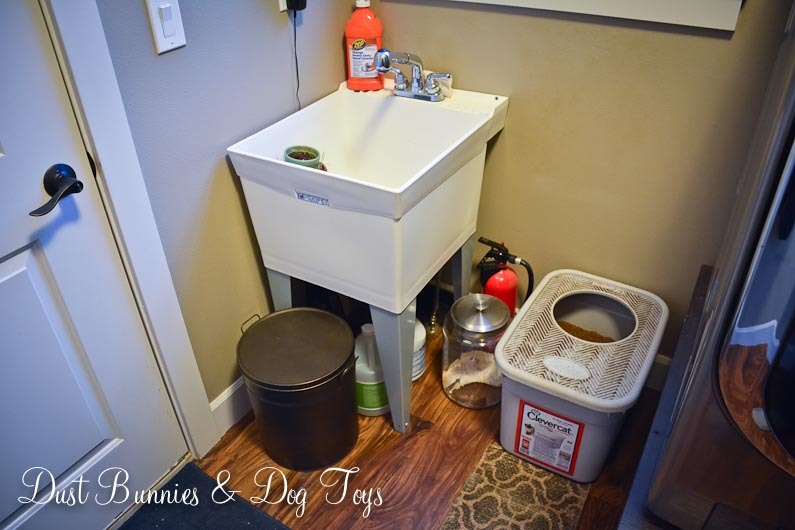 When we had the utility sink this handy little tray lived on the base of the washer/dryer pedestal because there was no room for it around the sink. Now that the cabinet has been installed (cue heavenly music) and there is a workspace, it finally has a respectable home on the countertop. Since I knew how they were arranged in the tray it didn’t bother me that the bottles weren’t labeled, but the hubs will occasionally start a load of laundry for me and requested that they be so he doesn’t “screw it up”. That seemed like a legitimate request, so I agreed and then promptly put it on my to-do list where it got lost among a myriad of other items. 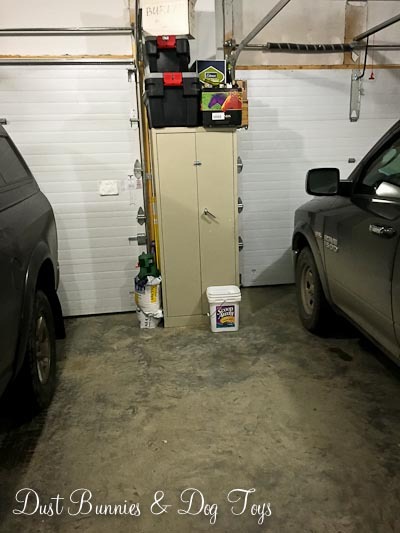 First Project of No Spend January – A Laundry Room Cabinet! I’m so excited to share this project with you all because I’ve been dreaming about it since before we moved in! 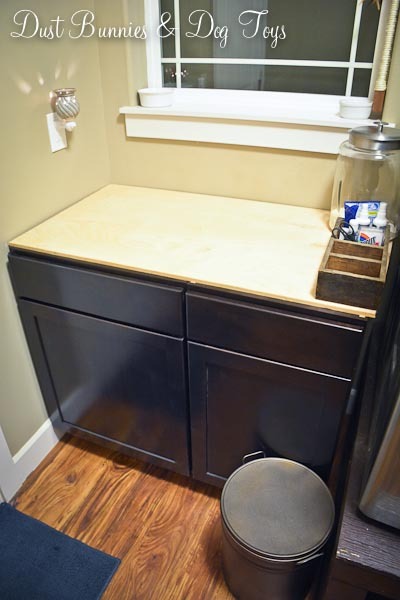 Our builder provided a basic utility sink in the laundry room which is great for washing large items but didn’t make good use of the space around it so the plan has always been to replace it with a cabinet matching the ones over the washer and dryer. We have a large remnant piece of granite from our kitchen that would create a counter top with a deep sink perfect for pretreating laundry or folding while creating lots of storage underneath for cleaning supplies. Seeing this every day as I enter or leave the house for the last year seriously made me twitch so I was definitely ready for this project to come to fruition. The plan started to become a reality when I recently found a free cabinet on Craigslist that was the perfect size of the space. Someone was remodeling their bathroom and wanted it gone asap. It needed a replacement door and a paint job but that seemed reasonable for being free so I picked it up and hauled it home. Before I could start working on rehabbing my freebie cabinet, the hubs told me the backordered Christmas present he got me had finally arrived – two base cabinets matching the upper cabinets already in the laundry room! Because they weren’t a special order item he didn’t have to pay in advance so if we chose not to get them the store would simply sell them as regular inventory with no penalty to us and use the free cabinet to complete the project. 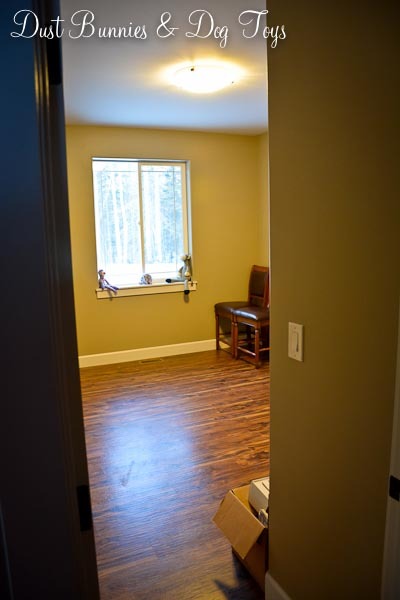 Although the new cabinets were obviously more expensive than it would be to update the free cabinet, time was a critical factor making the decision fairly easy. I also knew we’d I’d be happier in the long run if the cabinets were an exact match rather than just similar since they are so close to each other. And because they were my Christmas present they didn’t technically violate my No Spend January! 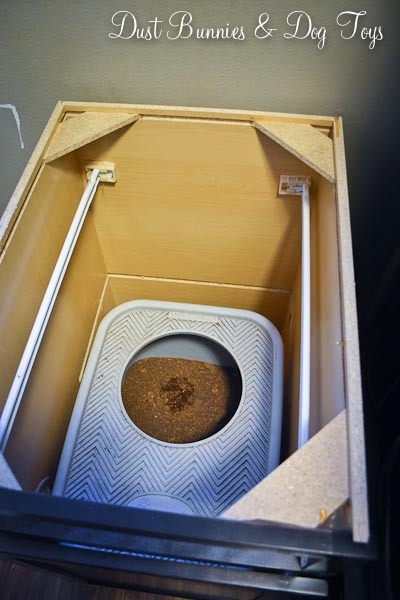 I wasn’t giving up on the plan so I decided the litter box would have to be what changed. We had a small plastic tub that we never use tucked away in the broom closet and I knew it would be the perfect size to fit the space. Since it would now be out of the dogs reach I no longer had to worry about having a box with a top, so problem solved. 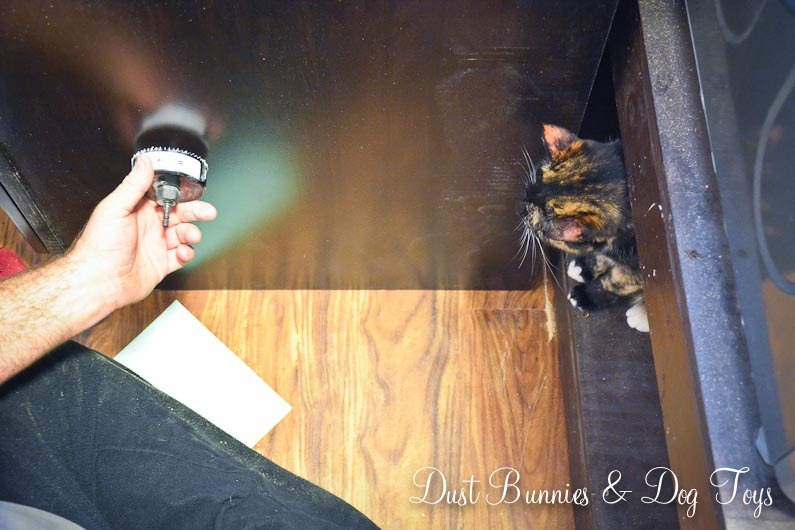 Once we’d decided how the litter box would be positioned, the hubs was ready to cut a hole in the side for Luna, who was apparently ready to give her input on the placement of this very important feature. 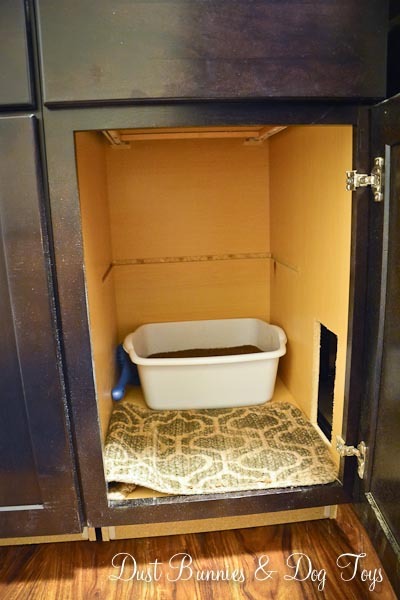 With the litter box situated and the kitty door cut, he moved on to installing the second larger cabinet which will hold the sink. He had to cut a hole for the drain pipe on the side and for the water lines on the floor, but everything fit perfectly. Since we don’t have the countertop and sink ready just yet we covered the top with a board for now and left the shelf in the back of the larger cabinet as is until we see how the P-trap sits. I quickly stashed the cleaning supplies that had lived under the utility sink and in the cabinet above the washer away in the second cabinet and stood back to admire the clean look. Plus I now have a spot to store all my laundry supplies within easy reach of the washer. (Cue heavenly music!) It’s so nice I don’t even mind that the cat food storage tin sits in front of the cabinet because it blends in! I’m glad we decided to go with the new cabinets because having two cabinets separates Luna’s space from where all the cleaning supplies are stored, which makes storing things she shouldn’t get into easier and keeps kitty litter from migrating into said supplies. I was tickled to find the litter scoop fit right next to the tub and the current litter rug (which is actually a $2 placemat from Home Goods) filled the rest of the space making the possibility of litter being tracked out of the cabinet pretty slim. Plus the drawer in the top of that cabinet provides additional ‘cat proof’ storage. 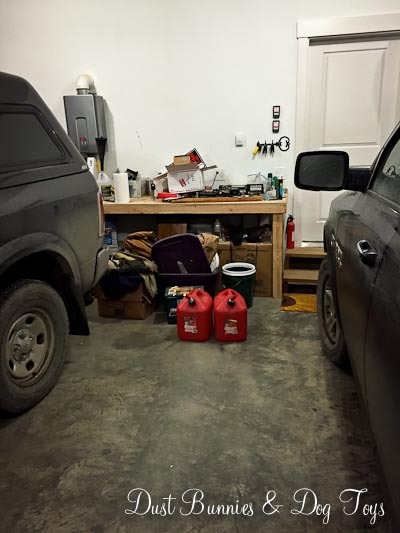 Not only does it make our laundry room much more functional it’s improved the traffic flow through the space since this is only access to the garage. We still need to install the kick panel at the bottom and add some hardware to the drawer and doors but it’s fine as is for now. I have no idea how much it will cost to have the remnant cut to size and fitted for the sink, but it’s certainly less if we had to purchase the material. The hubs ordered a sink he found on sale at Amazon and it should arrive later this month, which gives us time to get a few quotes and choose a company to do the measure and install – sometime after my No Spend January. The cherry on top was selling the un-needed freebie cabinet and old litter box for a few bucks to offset the costs and keep clutter at a minimum! Since I we were on a roll in the laundry room I also tackled labeling my laundry supplies the same day, so watch for a post on that very soon. Around this time last year the hubs suggested we try the 52 Week Savings Plan he’d seen online. 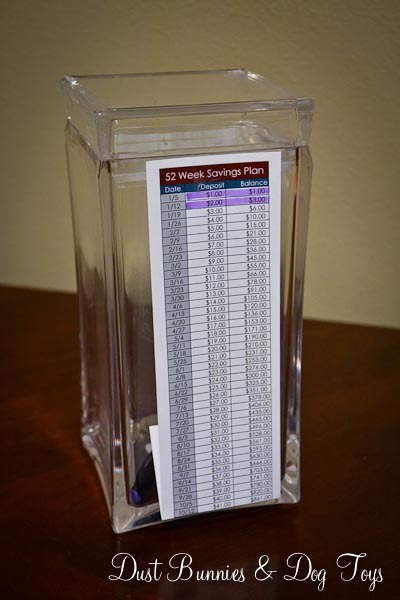 The idea is pretty simple, the first week you put $1 into your designated savings container and then increase that amount by a dollar each week. If you stick with it, you’ll have $1,378 at the end of the year. We decided to both take the challenge, which would give us just over $2,700 in savings. Not a bad thing to have as a home owner. I appropriated some clear jars I had laying around, printed two of the weekly savings chart and attached one to each jar. It was pretty easy in the beginning since the amounts were so minimal, but as we headed into the last third of the year and the amounts were increasing it became a little more difficult. Most of the dollars in my jar came from selling items we no longer needed or wanted on local online buy/sell pages as we settled into our new home. It was a win-win, less clutter in our house and a few dollars in savings. I will admit that both jars were raided on a few occasions when “life” happened and we needed cash for something. Thanks to my photography clients, my jar recuperated but the hub’s jar never did. Luckily, my jar’s balance covered Christmas shopping for our family with enough left over to open a new savings account. We’ve decided to give it a try again this year because it’s good to build a habit of saving, even if it takes a few attempts. I’ve read several financial gurus’ opinions both for and against the idea. Some suggest doing the plan in reverse, starting week one with $52 and decreasing the amount by $1 each week to make it more rewarding. Others suggest using an automatic transfer to a savings account rather than having the cash sitting around. Both are good ideas but for now we’ll stick with the original and keep it simple. Both jars already have their first dollar in them for this week and mine has $2 more for next week thanks to another online sale, so we’re starting out on a good note. Have you done the 52 Week Savings Challenge? Tell me about it. Did it help you create a habit of saving that continued and how did you use the balance at the end? Happy New Year! Today is a busy one at the DB&DT house. I’m taking down all the Christmas decorations (since I won’t have another chance to do so for weeks) and we’re starting a few of the projects I have planned for 2015. But it’s also the beginning of my choice to have a “No Spend January” as part of my desire to pay off debts and better balance our financial standings. What is “No Spend January”? It’s actually pretty simple, I will only be purchasing or spending for those items that are necessary – groceries, gas, regular monthly bills. So that means no trips to the thrift store, Target or through the clothing department unless it’s for a necessary item, which isn’t likely. Luckily I got a few gift cards for Christmas – one for $40 at Target and another for $40 at Pier 1, plus I won a second $35 Target gift card in a local contest. So I have a bit of a reserve I can utilize if I just need to go browsing. The hubs and I also got a $100 gift card to Home Depot for Christmas so that provides for any supplies I might need to work on projects in the mean time. The hubs also received a $40 gift card to Lowes for Christmas, but he’s not participating in my no spend project and I’ve told him those dollars are for him to use finishing his egg table. It’s a pretty hefty list, but I’m excited to see all those projects accomplished and removed from my to-do list. Doing it all without spending any more money is the cherry on top! So stay tuned to see how it all turns out over the coming weeks! And if you’d like to join me on this adventure share your journey as well!